I don’t mind a bit of ‘iffy’ weather when we are out in the hills, but strong winds can make a day miserable. We seem to have had more than our share of strong winds this winter, so a calm day is usually a cue to head for the hills. 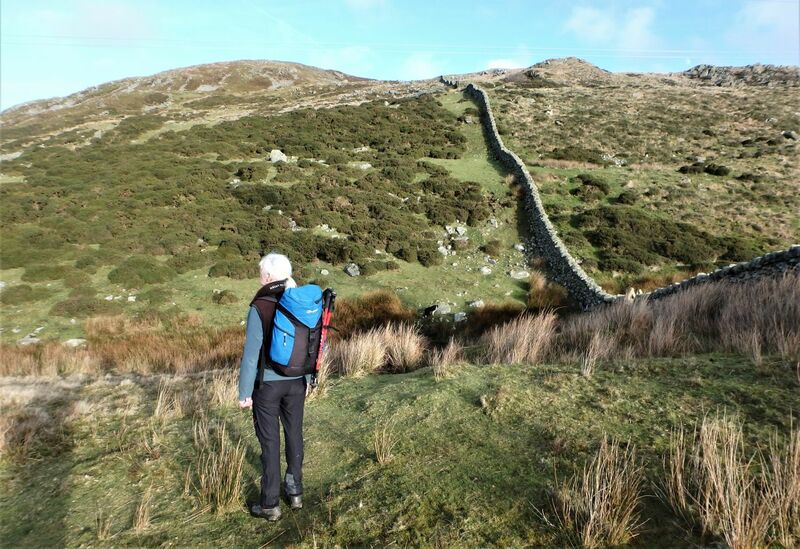 Add a bit of sunshine on top of that, and you can’t go far wrong, so a calm, sunny day in January was a good excuse to head for the northern end of the mountains of the Carneddau. 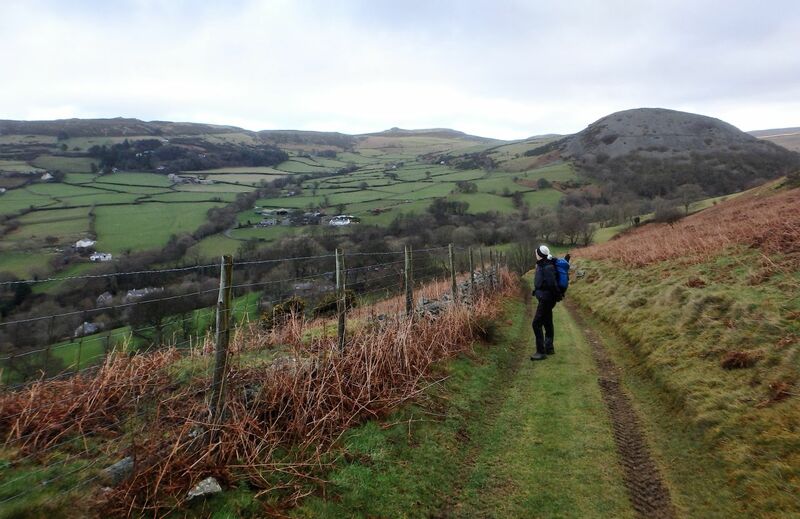 On the slopes of Garreg Fawr …. 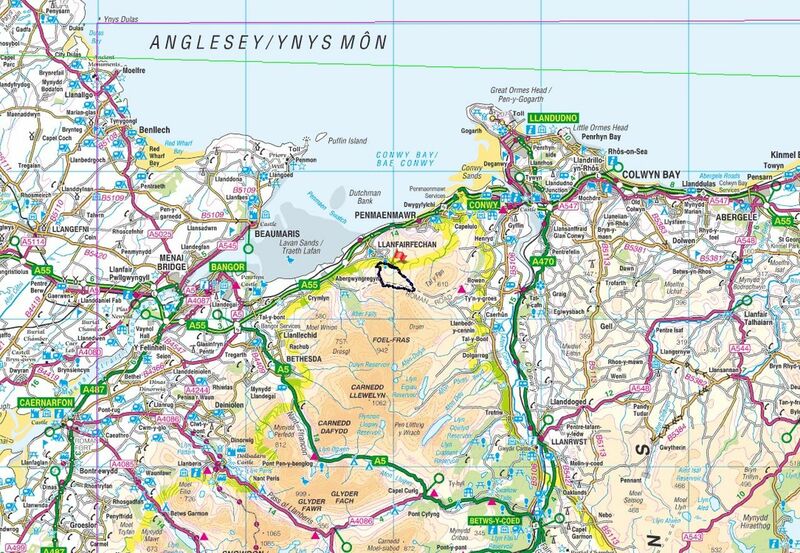 We have filled in most of the gaps on the lower-lying northern fringe of the Carneddau, but there’s almost always something new to see, so Chris and I (plus Border Collie ‘Mist’ of course) set out from Llanfairfechan towards the old Roman Road that once ran to Caernarfon from the fort of Canovium near Caerhun in the Conwy Valley. 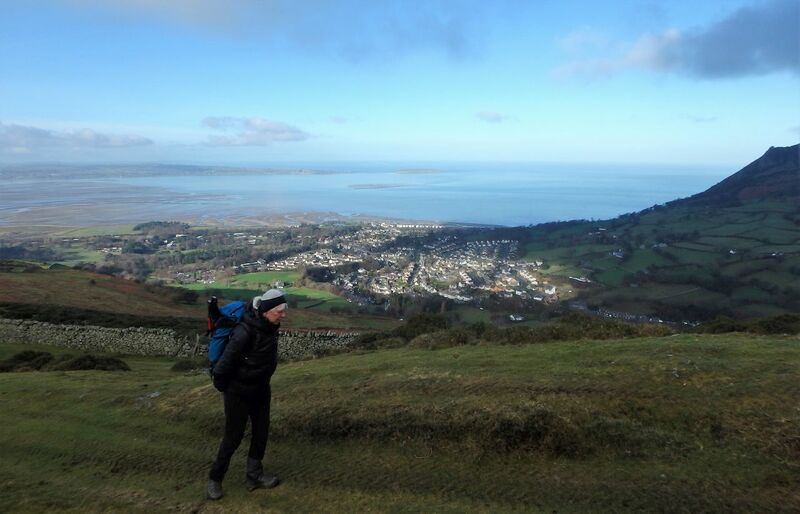 The lower farmland above Llanfairfechan was a regular pain in the arse! We use the ‘Rights of Way’ on the low ground, but these are not always easy to follow, especially when a couple of ‘creative’ diversions have been added by farmers – at one point, the stile over a wall became more of a barrier than an aid, and even the dog looked perplexed as to how to get over. 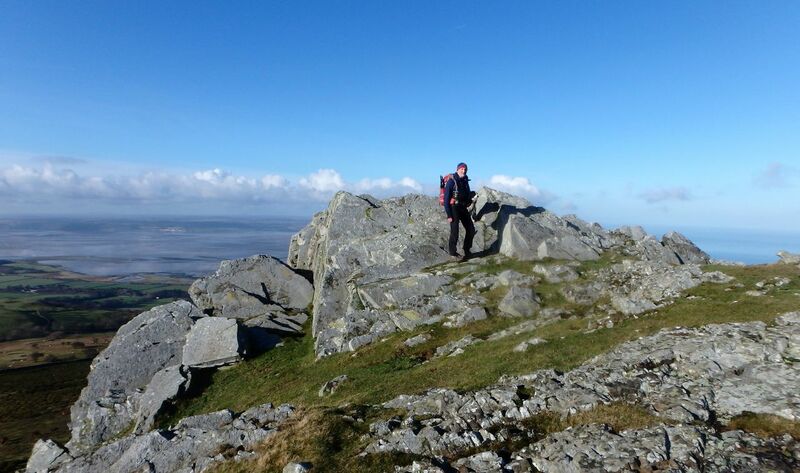 It was a relief to get out onto open ground on Garreg Fawr. 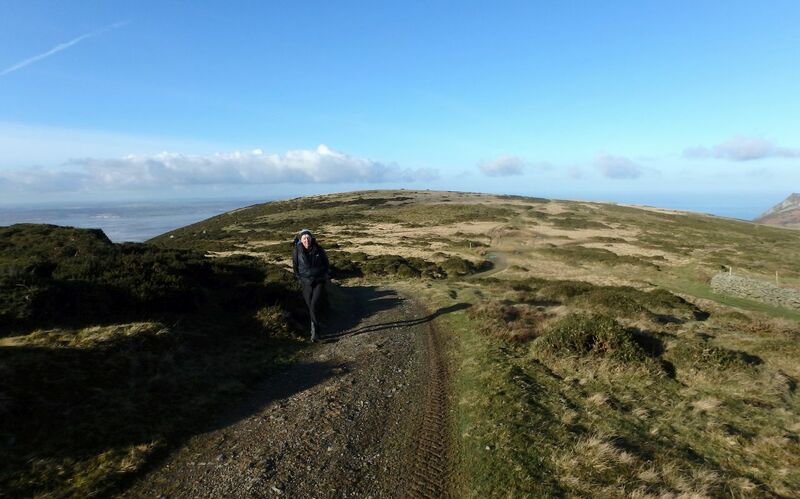 Heading on towards the Roman Road …. 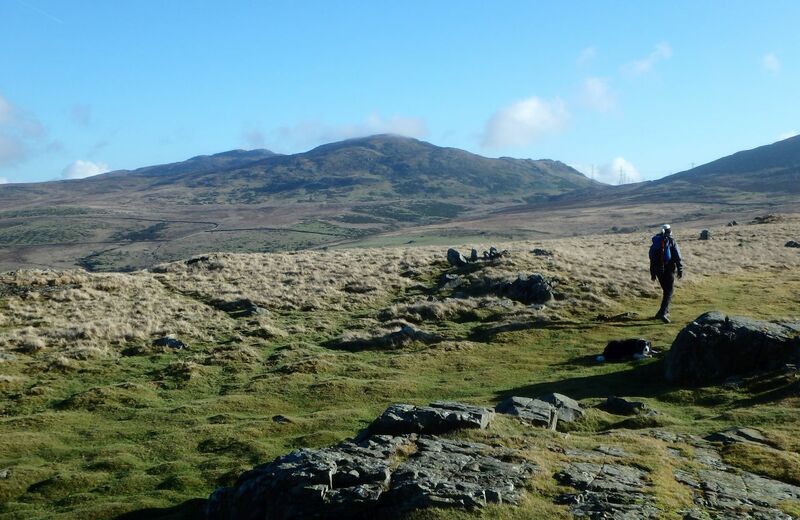 Garreg Fawr has two summits, the north one being small and rocky – sadly the southern summit was little more than a grassy mound, but at least we had the mountains of the Carneddau as a backdrop. 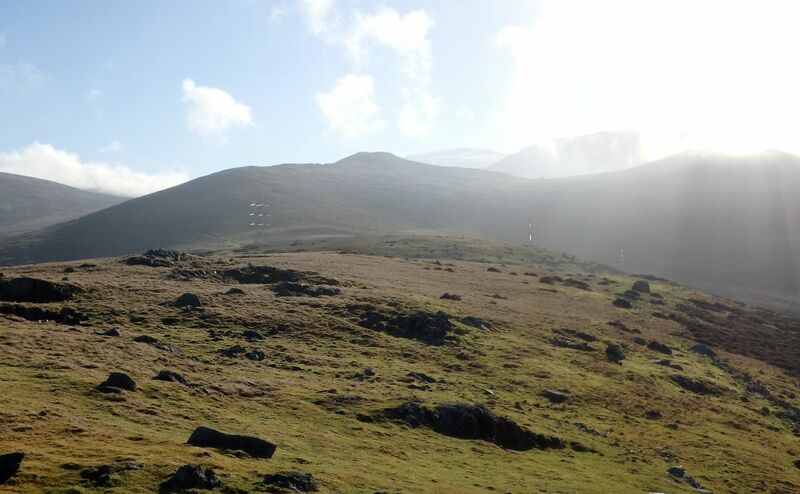 There was a bank of mist lying over the higher summits, but Foel Lwyd and Drosgl were easy to identify. Before long we were on the line of the Roman Road – the Romans were not the first here though, and on earlier outings we have traced some of the Neolithic remains along this ancient byway. 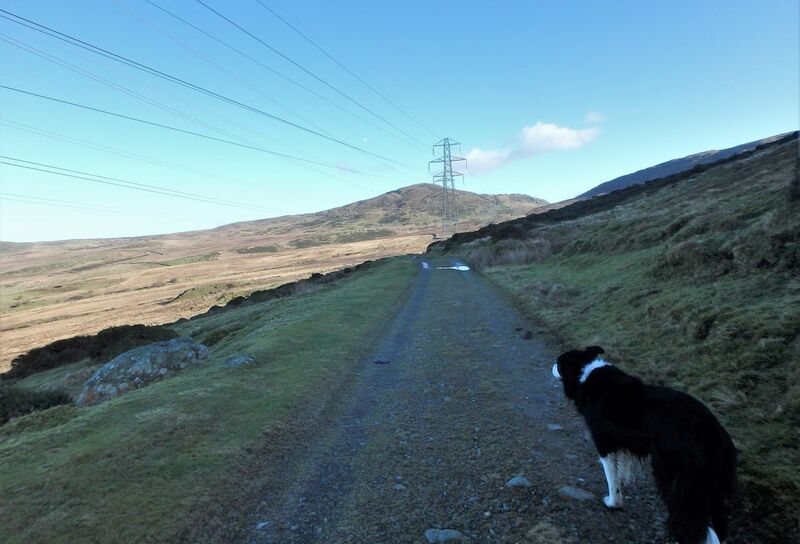 Some of the burial chambers and standing stones are thought to be about 5000 years old, so the Roman Road is a modern intruder at a mere 2000 years old – the power lines are a much more recent intrusion. 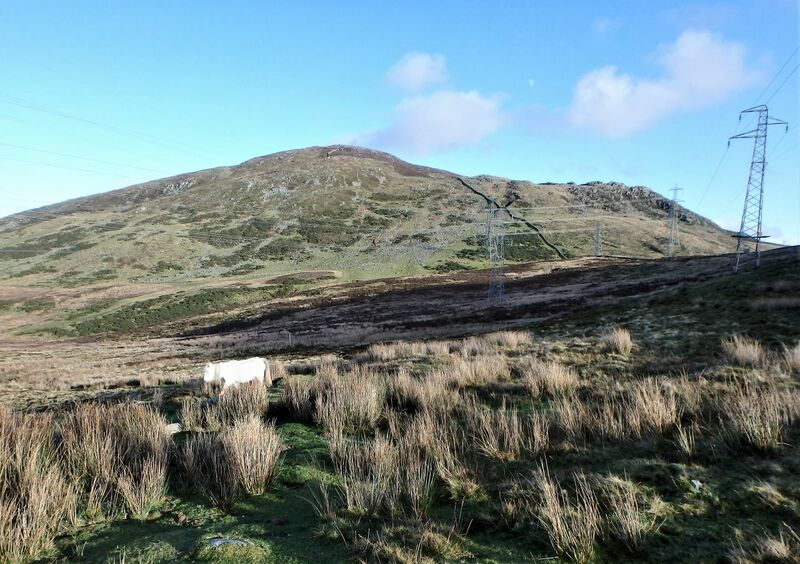 Foel Lwyd above the Roman Road …. 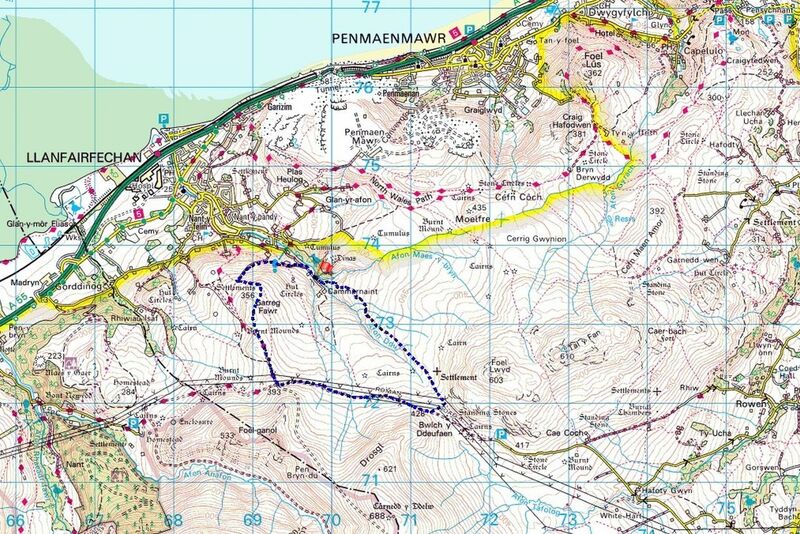 At Bwlch y Ddeufaen (the ‘Pass of the Two Stones’) we found ourselves at the base of Foel Lwyd, which eventually leads on to Tal y Fan (see post #175) but we had other plans. 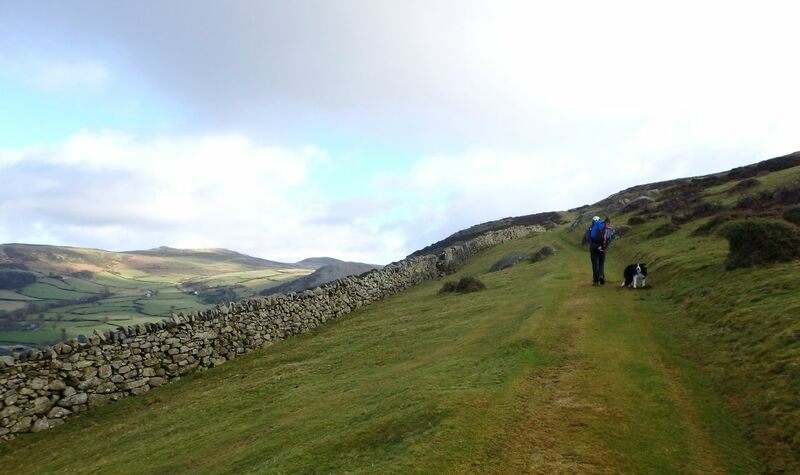 The route down the moor towards Llanfairfechan swapped mountain panoramas to sea views, but as we lost height we found ourselves back in farming country. Note to self – consider ‘wellie boots’ next time we come out this way!